Living Space: 2000 sq. ft. 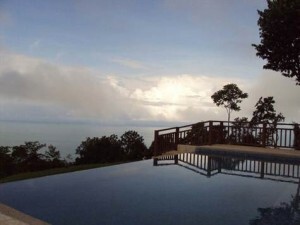 This is an amazing opportunity to get into Southern Costa Rica with a turn-key newly renovated vacation home completed in May 2010 and ready to rent for $200+ per day. This home is located on the only all cement road in the area and boasts one of the most breathtaking views of the Whale’s tail, sunsets and ocean landscape you will find anywhere! A fabulous infinity pool, extensive decking and cement work, large private yard with a jungle of wildlife is the envy of outdoor living. There is plenty of room to expand on this 3000 M2 lot with a private building pad above the property. Priced to move at $495,000 USD w/ Seller financing available.